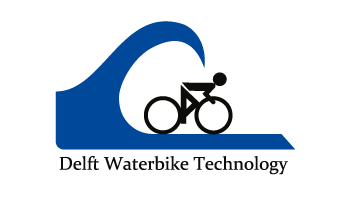 Last weeks we have been started with the production of our new waterbike! 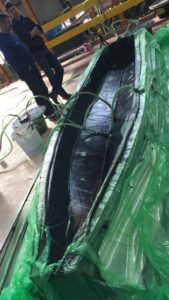 In this update, we will tell about the mould and hull design and production, as we now finished the bare hull of our boat! 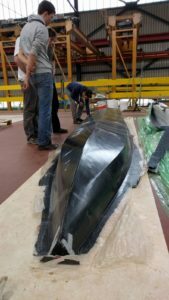 The boat has been built in an MDF-mould, which we produced in slices using a CNC-milling machine. The get our mould, it took three days to build it from the slices and several days more of pasting and sanding to get a proper result. 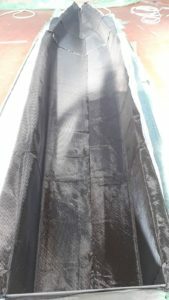 Instead of painting the mould orange, in style of the Olympic games, we discussed with the company Fibercore Europe about building in between two vacuum bags, to obtain a better result. On the first vacuum bag, we laid the pack of reinforcement, consisting of two layers of ±45°-carbon around a closed honeycomb sandwich core. After these were all in place, we closed it with the second vacuum bag and infused the pack properly. It was cool to learn so much new and to obtain a proper boat: the result is a lightweigth boat, adequately produced according the design!